Sorry I haven't posted in a while, things have been a bit busy. Let me catch you up on my latest projects. Recently I've been really focused on pattern writing. I had a cowl pattern accepted for a Knit Picks collection! That's taken up a bit of time since I've had to do lots of sample knitting and editing of that pattern. 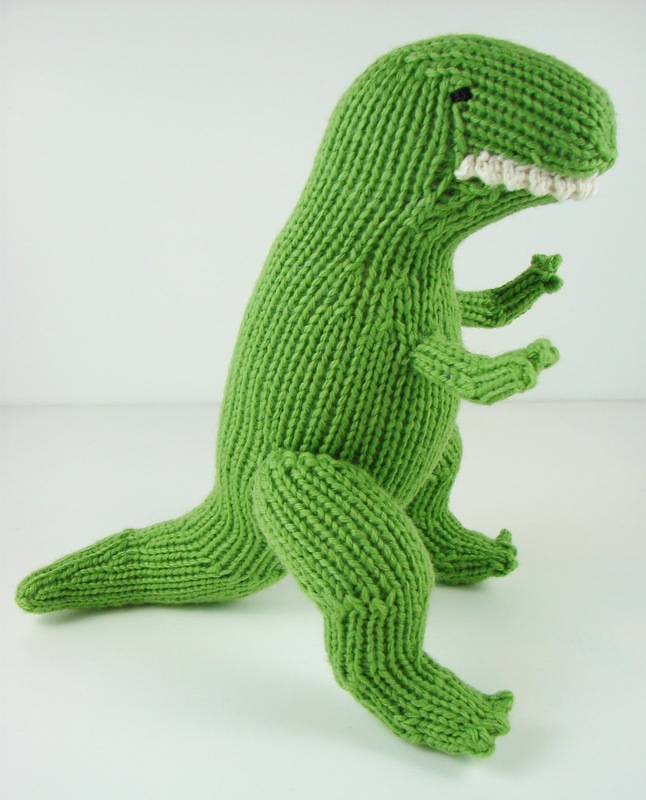 I've also been working on a few fun toy patterns: a dinosaur and a doll. My nephew is turning four in a few weeks. And what does every four year old boy need? A dinosaur, of course! I looked through all the dinosaur patterns on Ravelry and searched through tons of images of knitted dinosaurs on Google to see what was out there already. I couldn't find anything that looked like what I had in mind, so I decided to design one myself. 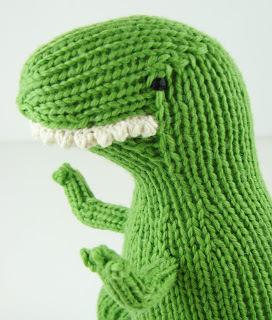 That way I could write another pattern and make a birthday gift all in one go. I used lots of short row shaping to get the tail and legs the way I wanted. The legs were a bit complicated, so I may have to work on them some more to make the directions easier to follow. I'm really happy with the finished product! Amazingly, he looks exactly the way I had imagined and there were only a few minor issues to work through. 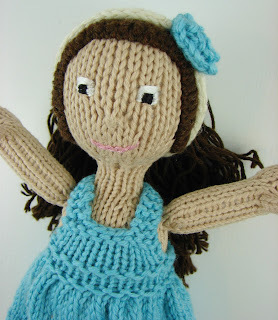 The biggest project that I've been working on lately is developing a pattern for a knit doll. I plan to design a collection of patterns for clothing to go along with her. My ultimate goal is to get the patterns published into a book. 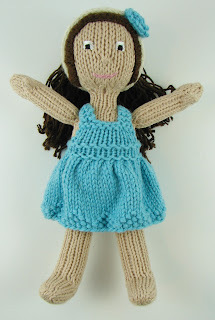 I have had lots of fun in the past making and designing cute outfits for knit bunnies, but the bunny pattern that I use is by Debbie Bliss and I wanted a pattern for my clothes to go on that I designed myself. 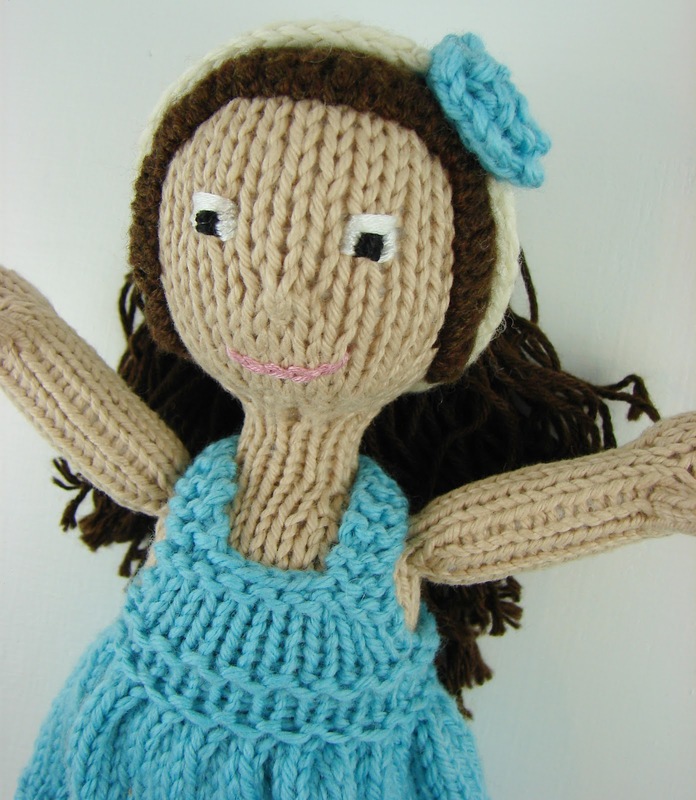 Here's a sneak peek of the latest finished version of the doll. I already have a newer version started. I adjusted the way the chin is shaped to avoid the gapping that was happening between the stitches on her neck. I'm also still working on trying to figure out a nose option that I like. In this version, I just used a scrap of yarn to pull some of the stitches together. It works, but I'd like to figure out something better. Each version looks cuter than the last. I can't wait to have the doll pattern perfected so that I can start designing more clothes! I love your t-rex pattern. I have been looking for one and have been dissapointed, but yours is great. i would love to know when yours is for sale!